Introduced in 1997, the North American Industry Classification System (NAICS) is a collaboration between the governments of Canada, Mexico, and the United States stemming mostly from the North American Free Trade Agreement (NAFTA). Its purpose is to categorize narrowly defined economic activities, or industries, in a consistent manner among the three trading partners, although the system does leave room for fine level customization within each country. NAICS is a replacement for the United States' 1987 Standard Industrial Classification (SIC) system, which is gradually being phased out in most new federal statistical studies and publications. In Canada, it replaces the 1980 SIC, and in Mexico NAICS replaces the 1994 Mexican Classification of Activities and Products. The NAICS is broadly compatible with the United Nations' International Standard Industrial Classification (ISIC) of 1989, although it differs greatly in the specifics. The underlying philosophy behind NAICS is a production-oriented model of the economy, which groups activities by how similar their goods- or service-producing processes are. This is distinguished from a product orientation, which groups activities by the similarity of the output. The SIC system followed a hybrid approach, with some industries defined more by process and others defined by product. Neither the SIC nor the NAICS are intended to be product classification systems. Other systems like the Standard International Trade Classification and the Harmonized System, both international standards used for trade classification, exist for this purpose. However, a NAICS-related effort known as the North American Product Classification System (NAPCS) was initiated in 1999. Scheduled to be released in 2002, NAPCS would include both products and services, unlike most of the older merchandisebased classification schemes. In addition to aligning the three countries' classification schemes, NAICS also portrays the structure and specificity of economic activity differently from its predecessors. In the U.S. version, for instance, NAICS identifies 358 new industries that weren't considered separate industries in the SIC—a few weren't even mentioned. Examples of newly recognized industries include fiber-optic cable manufacturing (NAICS 335921), warehouse clubs and superstores (NAICS 45291), fast-food restaurants (NAICS 722211), credit card issuing (NAICS 52221), and marketing consulting services (NAICS 541613). There are differences in the broader structure as well. Special emphasis is placed on service industries, which were often neglected under the manufacturing-dominated SIC. Indeed, well over half of the new industries fall under service headings, as do eight of the top-level sectors (or nine including informationrelated industries). Under the SIC there was only one broad service sector encompassing all service industry groups and industries. NAICS likewise revises how retail and wholesale businesses are distinguished so that any business that advertises to the general public is considered a retailer, regardless of whether its primary customers are businesses or private individuals. Finally, NAICS also recognizes entirely new sectors of the economy, notably information industries, which were formerly divided among the manufacturing, communications, and service sectors. NAICS is a hierarchical numerical coding system that begins with broad economic sectors at the top and winnows them down to narrow industries at the bottom (see Figure 1 for an example). In between there are either two or three intermediate levels. Each level is associated with a numerical code and a title. 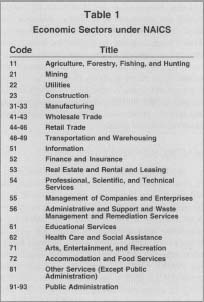 Sectors, such as manufacturing, agriculture, and construction, are designated by the first two digits in the code. Table 1 contains a listing of all 20 NAICS sectors and their codes. The next level down is the subsector, which indicates major groupings within the sector. For example, in the Real Estate and Rental and Leasing sector (53), the NAICS subsectors are Real Estate (531), Rental and Leasing Services (532), and Lessors of Other Nonfinancial Intangible Assets (533). The number of subsectors varies with the diversity of activities categorized under the whole sector. Altogether there are 96 subsectors. The third level from the top is the industry group level, represented by four digits. In some cases, NAICS industry groups correspond to industry definitions used by trade associations or in common language, e.g., Household Appliance Manufacturing (3352) and Clothing Stores (4481). NAICS recognizes 311 such industry groups. recognized). There are 721 five-digit industries in total. Some of these serve as the final industry definition used by each country, but in other cases a sixth digit is added for country-specific detail. An example is Small Electrical Appliance Manufacturing (33521). This is the definition accepted by all three countries; however, to it the United States adds at the six-digit level Electric Housewares and Fan Manufacturing (335211) and Household Vacuum Cleaner Manufacturing (335212). Hence, once you reach the six-digit level, it's important to know which version of the system you're using, e.g., U.S. version, Mexican version, because they may differ in the sixth digit. In the U.S. version, there are 659 six-digit NAICS industries, for a total of 1170 five- and six-digit industries at their most detailed level. For economic activities that are fairly discrete and homogeneous, such as running a gas station, the subsector, industry group, and even industry may be very similar. Gas stations, which fall under the retail sector, are in the Gasoline Stations (447) subsector, the Gasoline Stations (4471) industry group, and are divided at the five-digit level between Gasoline Stations with Convenience Stores (44711) and Other Gasoline Stations (44712). In this case there is no sixdigit defined. The method for determining an organization's code is essentially the same in NAICS as in any other classification scheme. Officially, the unit of analysis is by the "establishment," a term used to describe the smallest separate permanent unit of a company's activities, usually a single physical location. The alternative would be an enterprise-based classification. The establishment basis means that large corporations typically have several, and potentially dozens, of NAICS codes enterprise wide. When a single location performs activities covered under more than one NAICS category, the primary NAICS is assigned based on which activity consumes the most capital (if it can be determined) or generates the most revenue (more commonly used). In other words, industry assignment is based on the location's most important business activity in terms of value. Since NAICS codes are assigned by the location, large corporation headquarters represent a special case. Intuitively, a person might identify General Motors Corp.'s primary industry as NAICS 336111, Automobile Manufacturing, but technically the headquarters should be classified under NAICS 551114, Corporate, Subsidiary, and Regional Managing Offices. While such distinctions mainly exist to satisfy the rigors of conducting economic censuses, in common usage, and hence in some non-government publications, the headquarters code is ignored and industry codes are assigned based on the activities that contribute the most revenue enterprise-wide. Thus, while NAICS is intended as an establishment-based system for government purposes, it also serves as an enterprise-based system for general purposes. The use of both five and six digits as the most specific level can create problems for understanding and storing data under NAICS. If the industry code is only expressed as five digits in a publication or database, a reader can't be sure at a glance whether it's at the most detailed level or not. Instead, he or she would either need to know the source's policy on industry codes (for example, whether they only use the five digit form when it's the most specific) or would need to refer to a master list of NAICS codes to see whether there's anything more specific. In some database environments, it may also complicate things to store both five- and six-digit codes. For instance, it may wreak havoc on relational databases in which the code references the full industry title in a master table. Or, if a report from a database is to be sorted by NAICS, all the five-digit codes may sort first rather than where they fall in the hierarchy (this problem could be easily fixed with programming intervention). One solution to storage and presentation problems is the practice of adding a zero to the end of fivedigit codes to signify that the five digit level is the most specific. This was a common practice under the U.S. SIC for showing higher level categories, and it solves the storage/sorting problem. But this can create data interpretation troubles, to wit: in the U.S. version of NAICS, there appear to be at least two instances when zero is used as part of a six-digit code, apparently when the digits I through 9 were used up. Either way, the zero still represents the most detailed level, and for many users this discrepancy will not be concern; however, when the sixth digit is a zero there is no immediate way to distinguish categories that are accepted in all three countries from those accepted only in one. Under the SIC, zeros were used mainly to signify that data had been aggregated to a higher level than the lowest. For example, SIC 2810 designated all inorganic chemical manufacturers, encompassing chlor-alkali producers (2812), industrial gas producers (2813), and so on. However, using NAICS, the zero in the final position is more ambiguous: does it mean that five digits is the lowest level or that the sixdigit data have been aggregated to a higher level? It's back to the same interpretation problem as when no zeros are added. Official U.S. government publications have equivocated on the subject. Some NAICS documentation suggests that a zero in the sixth position "generally" means there is no U.S. sixth digit defined, but in various tables the official documentation presents five-digit NAICS both ways—with and without trailing zeros—in different sections. Despite these concerns, for most general-purpose uses of NAICS it's probably safest and easiest to use the trailing zero on five-digit codes to avoid other potential problems. This will have minimal impact on most kinds of research. Data providers will need to put forth extra effort in their documentation to inform users exactly how NAICS codes are being cited. Although in general terms NAICS categories are intended to be comparable down to the five-digit level, there is a surprisingly long list of exceptions. These are areas where the three countries could not agree on a descriptive framework for the narrower areas of economic activity. For instance, in construction-related activities, the three national systems agree only at the two-digit sector level, diverging at the three-digit subsector level; the same is true in retailing, wholesaling, and public administration. Meanwhile, in finance activities, the systems diverge at the four-digit industry group level, as is the case with personal services, nonprofit organizations, and waste management services. Finally, in insurance and real estate activities, the systems agree down to the four-digit level and then differ at the five-digit level. Use of NAICS is already underway in a number of government and nongovermment statistical publications. Most notably, the 1997 Economic Census, which was conducted during 1998 and is gradually being released, used NAICS to classify all businesses. Publications based on the census also provide limited SIC backward-compatibility. Other government reports, such as annual industry surveys and employment data, have also been converted to NAICS, but the overall transition was expected to last until at least 2004. Similar to the SIC before it, NAICS is scheduled to be revised at five-year intervals, with the first update slated for 2002. Ambler, Carole A. "NAICS: The 'S' Doesn't Stand for Services (But It Could)." Business America, April 1998. Office of Management and Budget. North American Industry Classification System (NAICS)—United States, 1997. Washington: NTIS, 1998. U.S. Census Bureau. North American Industry Classification System. Washington, 1999. Available from www.census.gov/epcd/www/naics.html .